Dairy-Free Remedy for My Bad Pepper Burn. StoryTime! Christmas Fiesta. This year, we were trying out a new tradition: a Christmas Dinner Fiesta! The menu: fresh guacamole, pico de gallo, salsa verde, white corn tortilla chips with a thin layer of melted FYH vegan cheese on top, organic corn tortillas, sauteed sweet plantains, vegan sour cream, Mexican rice, black beans, agave-lime tempeh cubes and a giant bowl of crisp greens with diced citrus, doused in a bit of lime, agave and pomegranate dressing. Extra black pepper. Plus an extra special side dish: mushroom stuffed roasted poblano peppers. Stuffed with red wine, chipotle pepper, shallot and roasted tomatillo sauteed exotic mushrooms. Caution: Peppers. 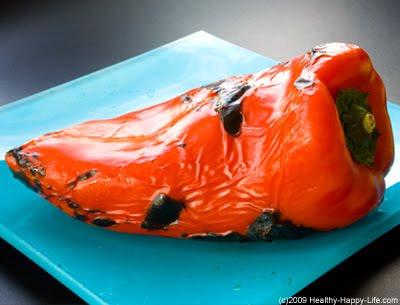 Usually when I'm cooking with any type of spicy pepper: jalapenos, poblanos, habaneros or serranos, I take extreme caution to avoid touching the spicy seeds and inner vein of the pepper. 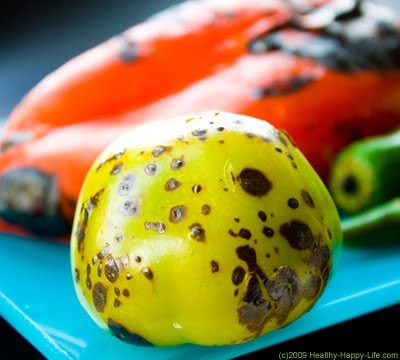 I am most cautionary when cooking with habanero (Scotch Bonnet) peppers. However, last night I wasn't terribly cautious with my poblonos and small jalapeno. I yanked out the seeds and ripped out the stems with my bare hands. I was hurried and just wasn't thinking. No gloves, no caution - just hands all over those seeds and stem. Yikes. I was fine, until I turned on the gas burner, and clenched my hand around a wooden spoon, stirring and sauteing the spicy mushrooms as a thick steamy spicy heat wafted over my chile-rubbed hands. Spicy steam: another dangerous kitchen occurrence. You know, the steam that clears your sinuses in a matter of minutes. Suddenly, two of my fingers were on fire! Not literally, but they were burning in chile-burn pain. Ouch. I'm hungry. So I ate. But the pain only got worse as dinner went on. I washed my hands in warm soapy water, but that only irritated the pain (and further dried my parched winter skin hands). The winter air and pre-holiday house cleaning had made my hands extra dry that day. Pain. Burning. I kept telling my husband that it felt like someone was "grinding a blunt rusted knife into my finger." I've experienced chile burns before, but this was hands down the worst ever. 1. Lime or lemon juice (lots of it) for a a few minutes. 2. Milk or dairy (a good soak in it). 3. Washing your hands in warm soapy water. 4. Rubbing alcohol, applied liberally. Then rinsed off. 5. Rubbing the flesh of a lemon or lime on the skin. So there I was wrist-deep in seething burn pain and my husband was in the kitchen squeezing the limes and prepping the ice packs. 2. Rubbing Alcohol. Next we tried wiping my hand in rubbing alcohol. Errrr! Same effect as the lime juice. Nothing. 3. Got Milk? Well since we don't drink dairy milk in my house, we just didn't have any! So I stuck to eating my dinner while my hand was covered in ice packs - the plastic kind. I pondered soy milk, but didn't give it a try (yet). Somehow I got through dinner and even through clean up and into my snugglies. Into bed and lights out. But suddenly the pain got worse. It felt like someone had taken sandpaper to my skin and started rubbing through the flesh and right onto the bone, then they dunked my hand in a barrel of flames and started slicing into my finger with a dirty knife. Trust me, this chile burn hurt. Emergency room? Ugh, not on Christmas! Although the pain was so bad that it did cross my mind. But what would they do? If they dunked my hand in whole milk ice cream I'd cry. Or laugh, if the pain went away... Anyways! I decided to try some aspirin and another ice pack. This helped. Lights out. Lights on! Ouchie! I was screaming and whining like a little girl getting her first flu shot. I was in pain and didn't know what to do! Dairy. I knew that the scientific remedy for any spicy food (hot mouth or hot hand) was dairy. But no, I wasn't sending my husband out to the 24 hour CVS drug store for a gallon of cow milk - for my hand. I screamed, "Get me a bowl of soy milk!!!" "Ahhhhhhhh." Wow. Immediate relief. Something about the combination of liquid and milk, even if it was the bean kind, really really helped. I felt like I had just come in from a blizzard and was submerged into a hot bath. It was heaven. The pain was almost completely gone. ...but my crazy night doesn't end there folks. Incredibly tired, I passed out, hand in milk. I woke up a few minutes later and decided I shouldn't go to sleep with a bowl of milk by my side, so I handed the bowl to my husband to take into the kitchen. Splash! Slosh! Darn, somehow the milk decided to leap from its bowl and all over the floor. 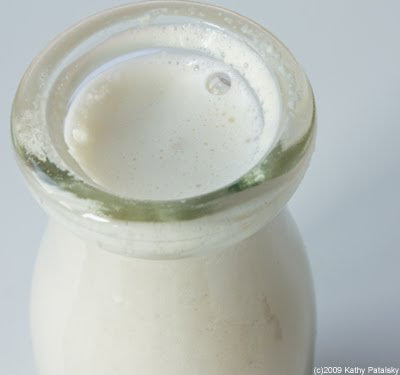 Winter white soy milk mess. Thankfully I got to stay snug in bed while my gracious husband cleaned it up. Tired, oh so tired. Snore. Zzzzzz. ...Awake again! Pain is back! Need more milk. This time we did a bowl of soy milk and a few ice cubes. I fell asleep, hand in bowl. I woke up around 3am with soggy wrinkled fingers. I groggily placed the bowl on the floor. Luckily, the pain had almost disappeared by then. My hand air-dried with a nice coating of soy milk as I fell back asleep. Zzzzzzzzzzzzz. I woke up around 10am the next morning with zero pain. Amen. The Moral of the Story. 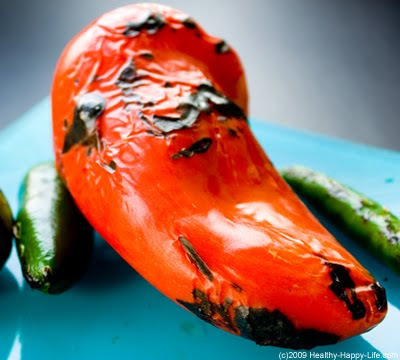 When cooking with peppers and chilies (no matter what their heat level) use extreme caution, especially if your skin is already dry from environmental or lifestyle conditions. Chapped winter hands and pepper seeds do not mix well.